Summary: In 1948, in the strange, silent aftermath of war, in a town overlooking the vast, blue ocean, Anikka Lachlan has all she ever wanted—until a random act transforms her into another postwar widow, destined to raise her daughter on her own. Awash in grief, she looks for answers in the pages of her favorite books and tries to learn the most difficult lesson of all: how to go on living. I am so excited to share with you my thoughts about THE RAILWAYMAN'S WIFE by Ashley Hay although I do think it will be difficult for me to express my feelings. This novel is beautifully written and it touched my heart like few books do. While the prose is quiet, it is an extremely powerful novel. THE RAILWAYMAN'S WIFE takes place in 1948 in rural Australia in the aftermath of World War II. Anikka Lachlan loves her simple life as a wife and mother; however, when her husband is killed in a brutal accident, she finds herself drowning in grief. She takes a job at the railroad library and tries to find comfort in books. Meanwhile, Roy McKinnon comes home from the war a damaged man. Prior to leaving, he was a poet but after seeing the the horrors of war, he can no longer find the inspiration to write. His friend, Dr. Frank Draper, also returns home but is haunted by the images of the survivors of the Nazi concentration camps. All three of the characters are trying to deal with their grief and start living again. Roy eventually finds his feelings toward Anikka provide the much needed inspiration he needs to start writing poetry again. However, when he leaves a love poem for Anikka to discover, she doesn't realize that Roy is the author. Roy becomes more and more upset as he waits for Anikka to acknowledge the poem and his feelings, while Anikka finds a special sense of comfort in "knowing" who left it for her. The reader is anxious for Anikka to realize that Roy is the author and how he truly feels about her; however, there is a quiet sense of desperation to the story. The conclusion is definitely unsettling and, at the same time, thought-provoking. 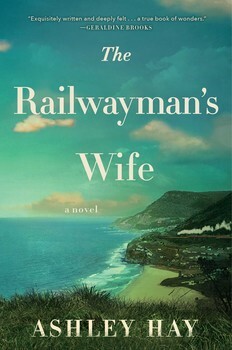 I loved THE RAILWAYMAN'S WIFE. I admit that the subject matter doesn't sound particularly exciting, and you might even say it's depressing, but I promise that the writing is so gorgeous that it makes you fall in love with the characters and their lives. I have to give major kudos to Ms. Hay because her prose brought this book to life and made me think about grief and loss in a very interesting way. Weeks later, I can still feel the pain in these characters. I'm afraid that I've portrayed this novel as being a major downer. It's true that it does deal with loss, but it also deals with healing... and I found that to be very uplifting. There are beautiful messages in this story about love, memory, and living; and I do believe that these universal themes make it a wonderful book club pick. There is a reading guide with twelve interesting discussion questions. In addition to the themes I've already mention, you also might want to explore the effects of war, change, marriage, death, and new beginnings. In addition, you might want to discuss the role of the ocean in the story along with your thoughts on the ending. I treasured each and every word in THE RAILWAYMAN'S WIFE. Highly recommended to fans of literary fiction. Wow, I can tell how much you loved this book! It sounds wonderful!